The students who attended were the top 3 “donations collectors” for our Walk-a-Thon and the Top Class by percentage. We had 2 additional treats to our lunch: John and Amanda from the AMOB gave each student a book congratulating them on their PAW PRIDE! The students eagerly started reading the books the minute they were in their hands. 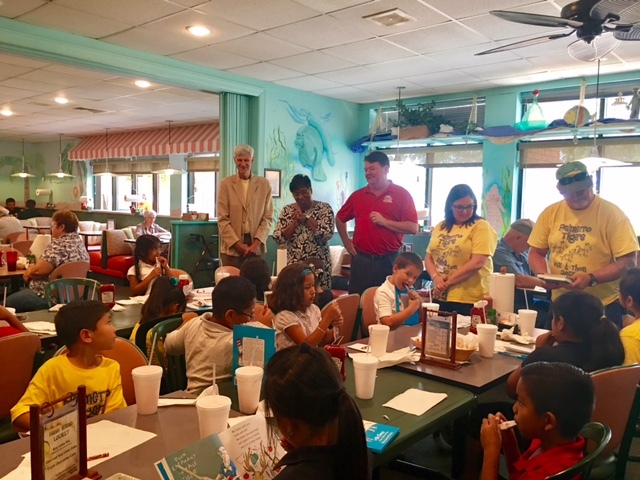 Also, Manatee County School District Superintendent Dr. Diana Greene was having a business lunch at the AMOB, and stopped by to congratulate and visit with the students. What a great experience for these AWESOME kids from PES!